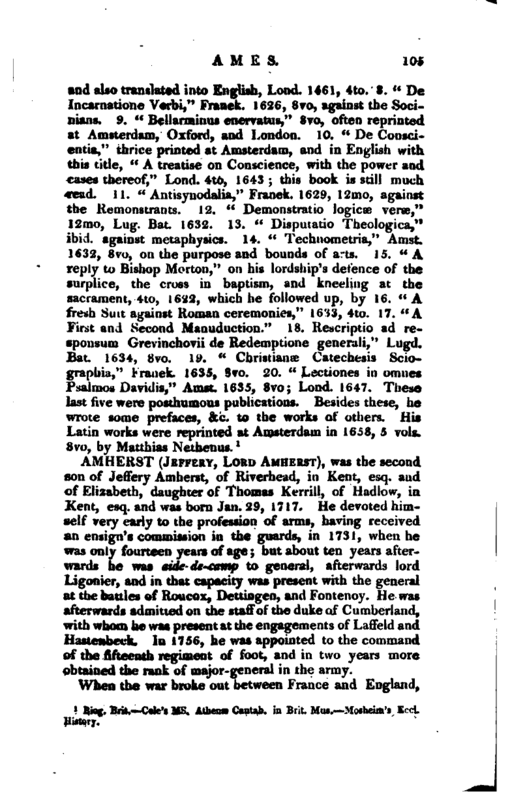 , a divine in the reigns of king James and Charles I. and famous for his casuistical and controversial writings, but much more so abroad than in his own country, was descended from an ancient family, which is said to remain in Norfolk and Somersetshire, and was born in 1576. He was educated at Christ-church college, in Cambridge, under the celebrated champion of Calvinism, Mr. William Perkins, and this gave a rigid strictness to his opinions, which was not agreeable to some of his associates in the university. One instance of this is given by Fuller, which we shall transcribe as recording a feature in the manners of the times. 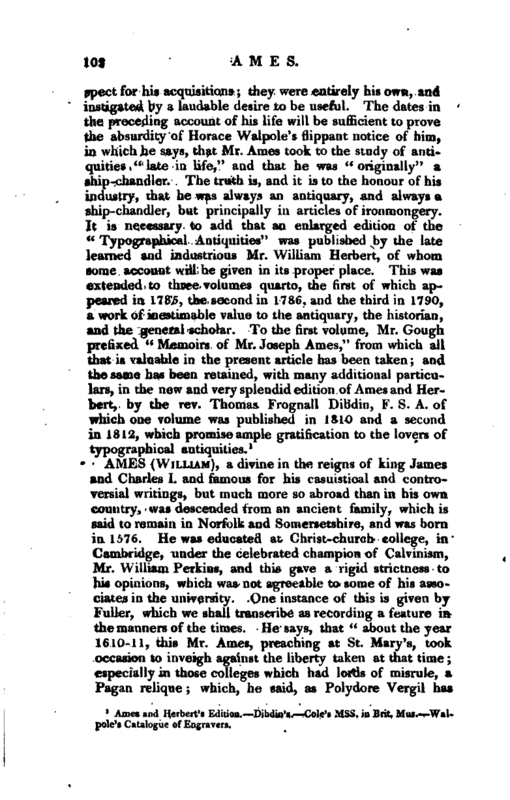 He says, that “about the year 1610-11, this Mr. Ames, preaching at St. Mary’s, took occasion to inveigh against the liberty taken at that time; especially in those colleges which had lords of misrule, a Pagan relique; which, he said, as Polydore Vergil has | observed, remains only in England. Hence he proceeded to condemn all playing at cards and dice anirming that the latter, in all ages, was accounted the device of the devil and that as God invented the one-and-twenty letters whereof he made the bible, the devil, saith an author, found out the one-and-twenty spots on the die that canon law forbad the use of the same saying Inventio Diaboli nulla consuetudine. potest validari. His sermon,” continues our author, “gave much offence to many of his auditors the rather because in him there was a concurrence of much nonconformity insomuch that, to prevent an expulsion from Dr. Val. Gary, the master, he fairly forsook the col lege, which proved unto him neither loss nor disgrace being, not long after, by the States of Friesland, chosen Professor of their university.” There seems, however, some mistake in this, and Dr. Maclaine has increased it by asserting in his notes on Mosheim’s Ecclesiastical history, that Ames fled to Franeker to avoid the persecution of archbishop Bancroft. This prelate certainly pressed conformity on the Puritans as much as he could, but a man who only preached against cards and dice could have nothing to fear from him. The fact was, that the archbishop died some months before this sermon at St. Mary’s. It might not, however, be long after, that he went to Holland, the common refuge of many of the divines of this period who were strong opponents to church discipline, for in 1613, his dispute with Grevinchovius, minister at Rotterdam, appeared in print. From thence, we are told, he was invited by the states of Friesland, to the divinity chair in the university of Franeker, which he filled with universal reputation for many years. He was at the synod of Dort, in 1618, and informed king James’s ambassador, from time to time, of the debates of that assembly. After he. 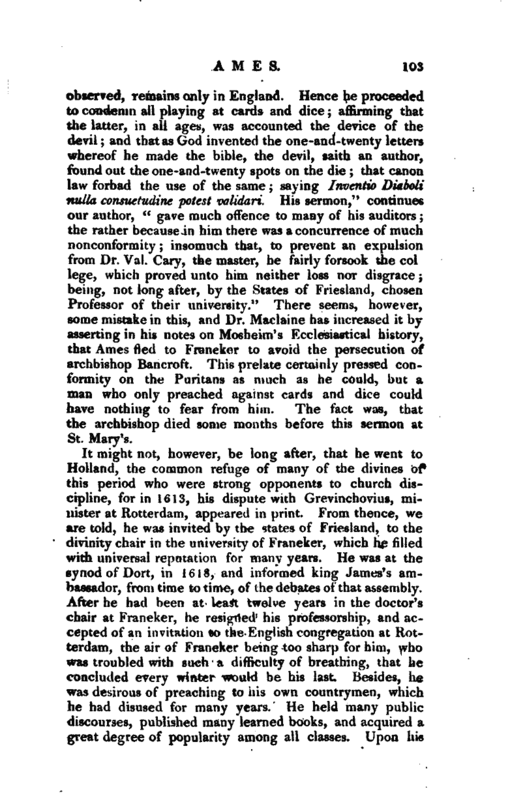 had been at least twelve years in the doctor’s chair at Franeker, he resigned his professorship, and accepted of an invitation to the English congregation at Rotterdam, the air of Franeker being too sharp for him, who tvas troubled with such a difficulty of breathing, that he concluded every winter would be his last. Besides, he was desirous of preaching to his own countrymen, which he had disused for many years. He held many public discourses, published many learned books, and acquired a great degree of popularity among all classes. Upon his | removal to Rotterdam, he wrote his “Fresh suit against Ceremonies” but did not live to publish it himself, for his constitution was so shattered, that the air of Holland was of no service, upon which, he determined to remove to New England; but his asthma returning at the beginning of winter, put an end to his life at Rotterdam, where he was buried, Nov. 14, (N. S.) 1633, aged fifty-seven. In the spring following, his wife and children embarked for New England, and carried with them his valuable library of books, which was a rich treasure to that country at tliat time Of his private character we know little, but it is generally agreed that he was a man of very great learning, a strict Calvinist in doctrine, and of the persuasion of the Independents, with regard to the subordination and power of classes and synods. As a teacher he was so much approved, that students came to him from many parts of Europe, particularly Hungary, Poland, Prussia, and Flanders. 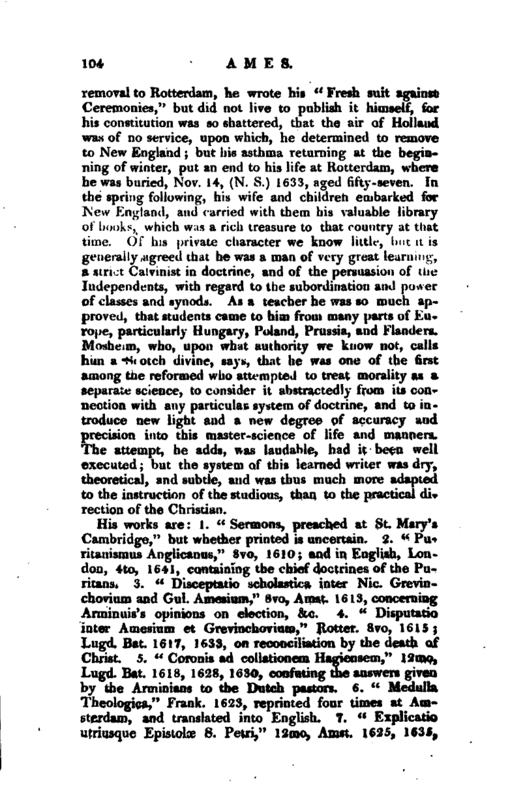 Mosheim, who, upon what authority we know not, calls him a Scotch divine, says, that he was one of the first among the reformed who attempted to treat morality as a separate science, to consider it abstractedly from its connection with any particular system of doctrine, and to introduce new light and a new degree of accuracy and precision into this master-science of life and manners. The attempt, he adds, was laudable, had it been well executed; but the system of this learned writer was dry, theoretical, and subtle, and was thus much more adapted to the instruction of the studious, than to the practical direction of the Christian. 1 Biog. Brit. Cole’s ms, Athena Cantab, in Brit. Muf. Moheiai’s Eccl. History.